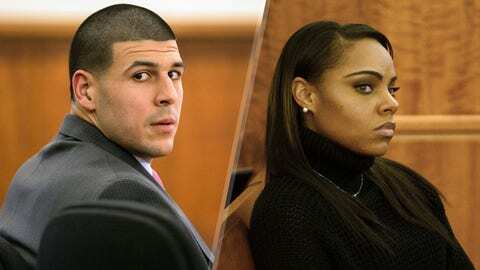 Will Aaron Hernandez's fiancee testify against him? Testimony was short Wednesday at the Aaron Hernandez murder trial, and the intrigue was toward the back of the courtroom, where the former NFL star’s fiancée sat less than 10 feet from him. Three times she and Hernandez made eye contact, and he appeared to mouth greetings to her — communication that came a day after a judge signed an order granting her immunity from prosecution, a move that paves the way for her to be called as a witness for prosecutors. Shayanna Jenkins, suspected by prosecutors of helping ditch the gun used to kill Odin Lloyd, was alone in the front row on Hernandez’s side of the courtroom. Everyone in the room was watching the interactions between the two, trying to discern clues about her ongoing relationship with Hernandez and whether she is prepared to turn on him from the witness stand. “I love you,” Hernandez mouthed as he left the courtroom after a short day of testimony, all of it marked by police officers and a paramedic describing their actions at the scene where Odin Lloyd’s body was found. But instead of answers, there were only questions. Did Jenkins reach an agreement with prosecutors and agree to testify willingly? 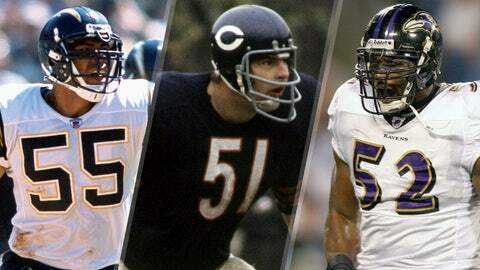 -Ranking the 16 greatest LBs of all time. Did prosecutors obtain the immunity order over her objections and, if so, is she prepared to refuse to answer questions on the witness stand — a move that could lead to a contempt charge and a jail term? Hernandez, 25, faces one count of murder and two firearms charges in the June 17, 2013, killing of Lloyd, who was gunned down in a secluded field less than a mile from the former New England Patriots tight end’s home. Lloyd, a 27-year-old semi-professional football player, was dating Shayanna Jenkins’ sister, Shaneah Jenkins. Prosecutors have alleged that Hernandez summoned two associates from his hometown of Bristol, Conn., to his Massachusetts home late the night of June 16, 2013, and simultaneously made plans to meet with Lloyd. Hernandez then allegedly drove the other two men, Carlos Ortiz and Ernes Wallace Jr., to the Dorchester neighborhood of Boston, picked up Lloyd, and returned to North Attleboro. According to court documents, Hernandez allegedly drove into a secluded area in an industrial park that is surrounded by woods and mounds of asphalt, gravel and dirt. There, Lloyd was shot multiple times. Although prosecutors have not said who they believe fired the fatal shots, they have asserted that Hernandez “orchestrated” the killing. Ortiz and Wallace have also been indicted on murder charges but will be tried separately. The prosecution does not plan to call either as a witness in the trial. 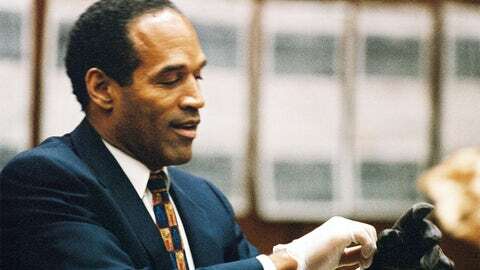 Gallery: Take a look back at some of sports' most notorious athletes-turned-felons. But since the immunity order for Jenkins was signed Tuesday, the dynamic between her and Hernandez, the father of her 2-year-old daughter, has been the talk of the courthouse. The order itself and the petition that led to it are shrouded in mystery, sealed from public view because they include secret grand jury testimony. Prosecutors have long alleged that Shayanna Jenkins, acting on Hernandez’s orders, secreted the murder weapon, a Glock, out of the home they shared, drove to an undisclosed location, and ditched it. Jenkins was indicted on a perjury charge, accused of lying to a grand jury 29 times about her knowledge of evidence in the case and her conversations with Hernandez, with whom she has a 2-year-old daughter. Now that Judge E. Susan Garsh has signed the immunity order, the question turns to when Jenkins will be called to the stand — and what she’ll say. In the meantime, Wednesday’s testimony mirrored that of last week: two police officers and a paramedic, each describing what they saw when they arrived at the secluded field where Lloyd’s body was found. Prosecutors played a video shot at the crime scene that zeroed in on a tire track and a footprint that they assert were left by Hernandez’s rental car and a pair of Air Jordan tennis shoes he owns. And defense attorneys took aim at the witnesses, eliciting testimony showing that there were a number of law officers who could have left footprints in the area near Lloyd’s body. For instance, defense attorney James Sultan elicited testimony from Massachusetts State Trooper Michael Lombard that he filmed two footprints at the scene, both at the request of a sergeant. “Did you film any of their shoeprints?” Sultan asked of investigators who walked in the area. “I did the two that were marked,” Lombard said. The point may ultimately become critical: Prosecutors hope to convince jury one of the footprints that was photographed was left by Hernandez; defense attorneys hope to convince the jury that many people could have left that print. Aside from testimony, Wednesday’s other news was that a second juror was dismissed. It is not clear why the juror was let go, but the dismissal occurred on the seventh day of a trial projected to last six to 10 weeks. That leaves 16 — 12 of whom actually will conduct deliberations at the end of the trial. And it leaves less margin for error: If five more people were to be dismissed, a mistrial would be declared. Testimony, delayed for unspecified reasons, is scheduled to resume Friday. Hernandez has separately been indicted on multiple murder and assault charges in a July 16, 2012, shooting in South Boston that left two men dead and another wounded. In the Boston killings, prosecutors have alleged that Hernandez became enraged after a man bumped him on a nightclub dance floor, spilling his drink, and failed to apologize. They alleged that Hernandez later followed the man and his friends as they drove away from the club, then pulled up next to their car at a stoplight and opened fire with a .38-caliber revolver, killing Daniel De Abreu, 29, and Safiro Furtado, 28, and wounding another man.